Hey there, blog friends! So- you've probably seen lots of these posts over the past couple months on the blogs of other card designers. 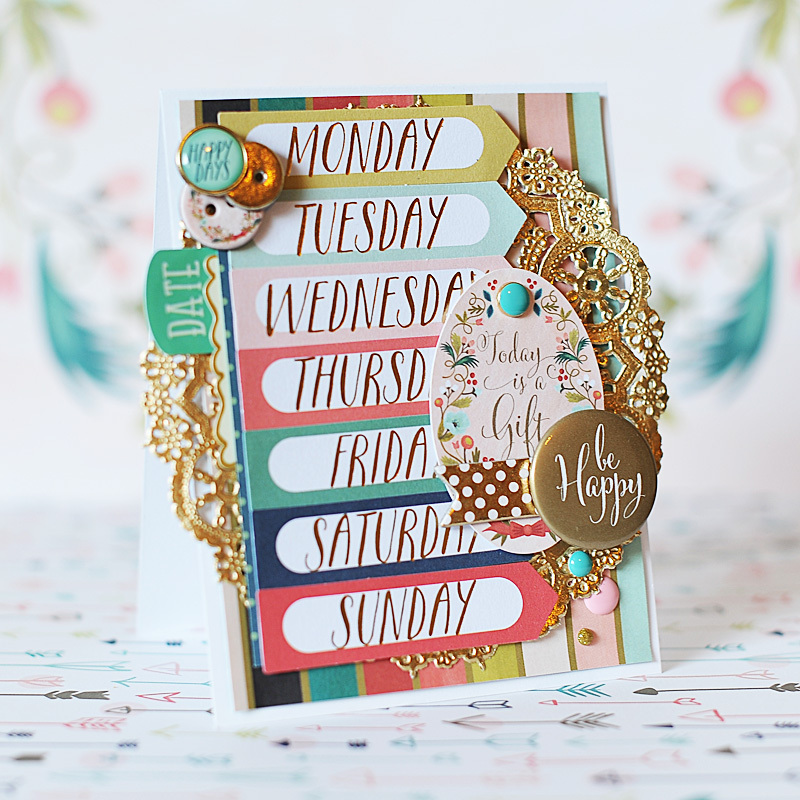 Well, I was tagged by Dana Fleckenstein (one of my FAVE Studio Calico card designers) to take part in the getting to know you blog hop this week. You can read more about Dana on her getting to know you post HERE. Well...I am in the middle of finishing my October design team projects for My Mind's Eye. Today I will also start working on a Winnie & Walter card for World Card Making Day. And tomorrow I need to finish my entry for week 1 in the Cropped 2014 contest at Pixels & Co. I don't have any sneek peak photos to share though. :( But, I also created this card this morning so I would have something to share with you! I fell in love with this week's Sunday Sketch from Studio Calico, so I used it as my starting off point in the card design. 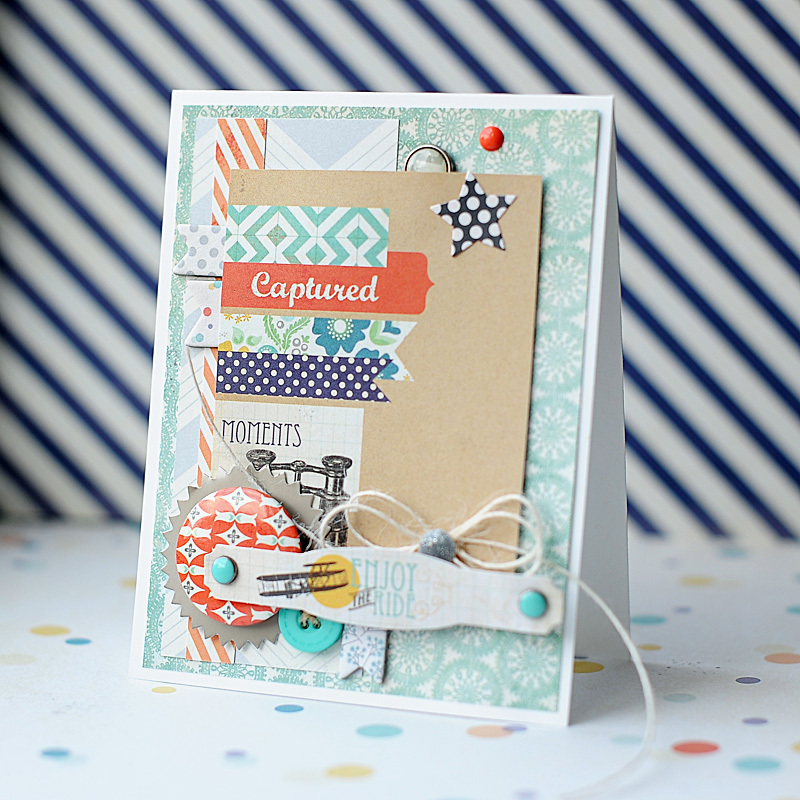 I love how you can use a sketch, and your card still looks completely different from all the others! 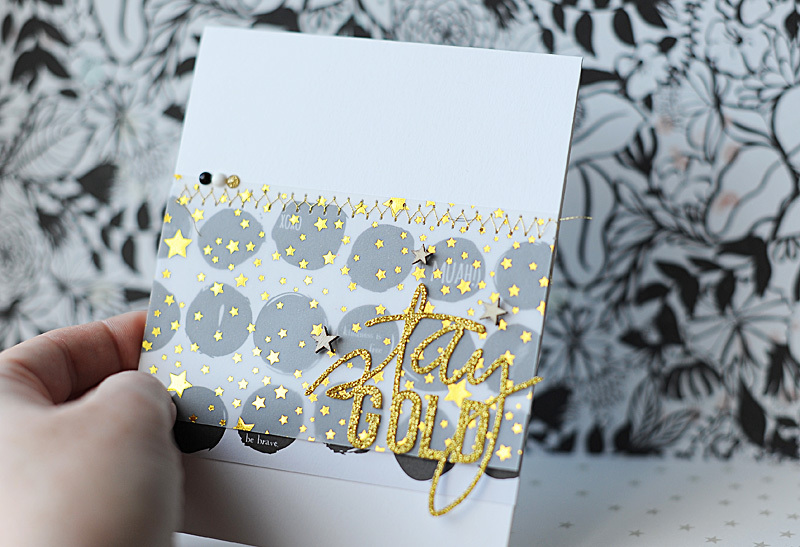 I also created this for the Simon Says Stamp "Anything Goes" Wednesday challenge. I find inspiration in a lot of different ways. I LOVE card challenges. I find them such a great way to get started, and there are so many different types. I have a list of all the different card challenges, and I try to update it daily so I have the most current ones in my mind as I create. I also really love product...and I find that it inspires me just as much as challenges do! If I genuinely love the product I am using, creating is such an organic process for me. On the flip side...if I am trying to create with something that isn't my favorite, I really struggle with it. What method/process do you apply to each of your creative projects, and how long does each project take to complete? I always get a solid design in mind first, often found in my favorite sketch challenges. Then I pull all the product that I might want to use on the project so it is readily available when I want to grab for it. I might not use it all, but I like it to be handy!! After that I just start cutting paper & placing items together on the card front. I don't completely adhere anything down until I like how it looks, and then I add in finishing touches after that. I don't really worry too much about time...as long as I am enjoying myself it doesn't really matter to me. One card can take me minutes....or hours. If you had to describe your 'signature' style, what would it be? Truthfully...I think my style is a little eclectic. I like bits of every type of style, and product! I think the one thing that stays pretty consistent with me is that I follow trends, but not to a fault. I still try to have sound designs that are pleasing to the eye, and that a recipient would enjoy to get in the mail. 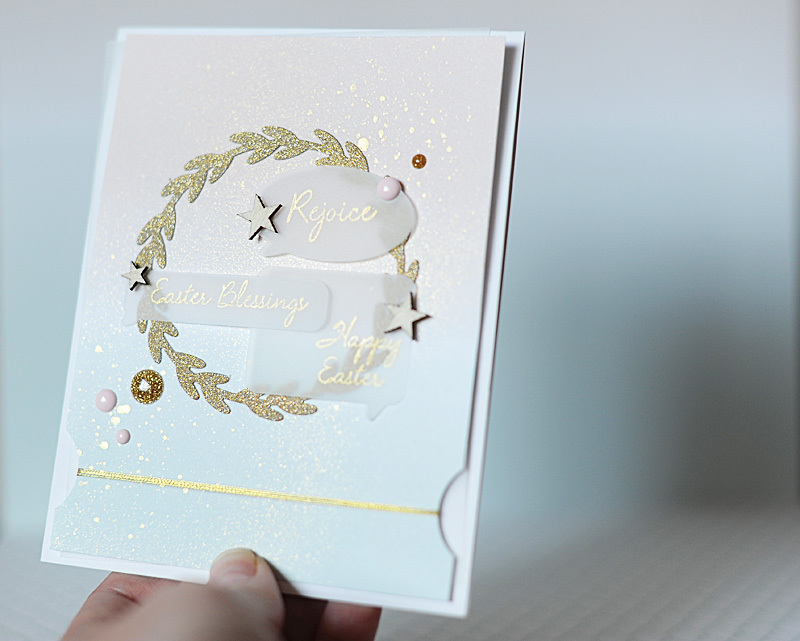 I use white a lot, and like my cards to have that nice & bright feel to them. Honestly- I don't know how else to describe my style!! And now on to two of my favorite card designers!! Jocelyn Olson - I am in awe of her hybrid abilities, and how "free" she seems to be when creating cards. I love how she layers papers with unevenly cut edges to them, all the bits of stitching that she does here & there, & how she dabbles in all different mediums when it comes to her cards. Not to mention...we've gotten to know each other through Glitz, and I think we would be besties if we lived in the same town. Lol! Miriam Prantner - She is like, always ON. Almost every single day you can go to her blog & she has an amazing project to share with you. 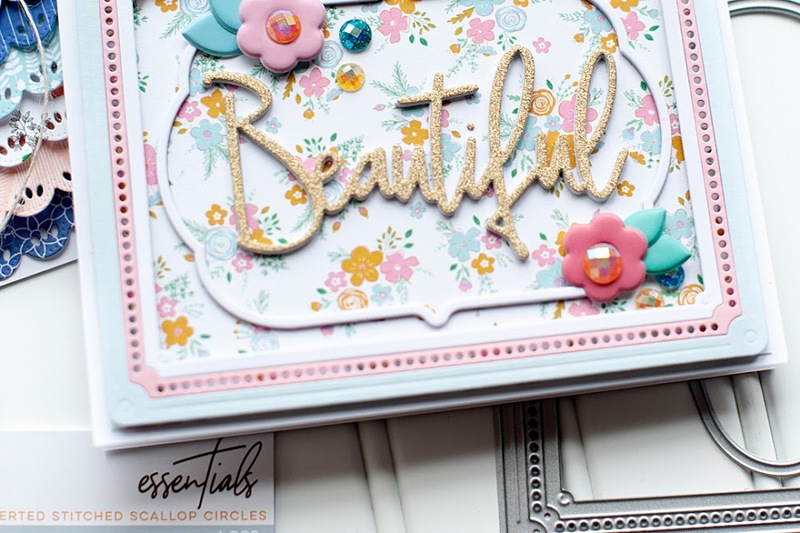 She is an excellent stamper, and her clean style always showcases the stamp sets that she is working with so perfectly. Not to mention...she is so great about checking out other people's work & leaving them comments! She makes me want to get better at this...it is is easy to like something on Facebook or Instagram, but very rarely do people comment any longer unless it is a "famous" designer's blog. 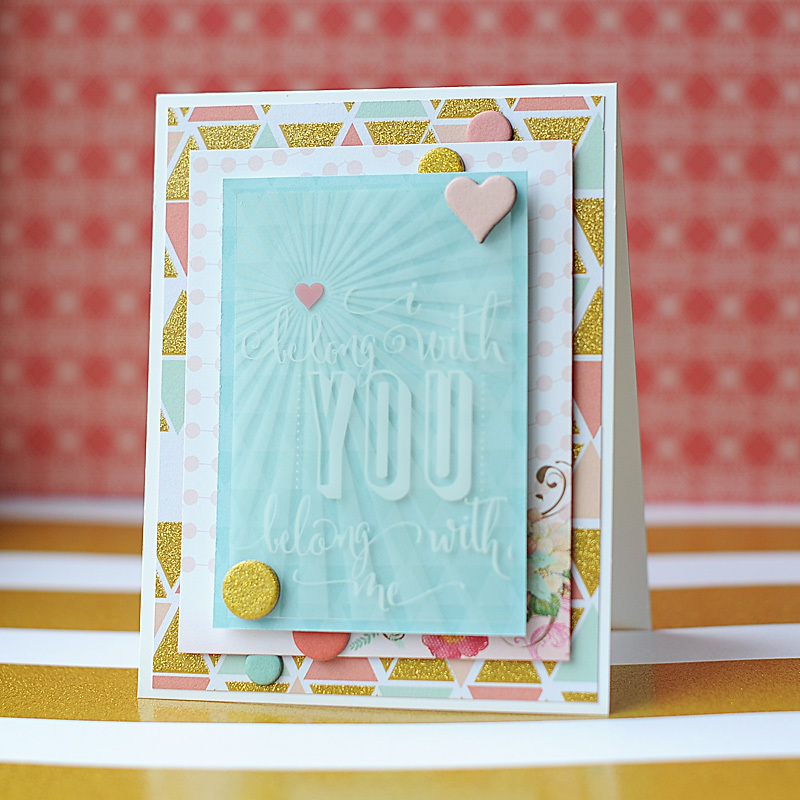 She makes me want to be better at leaving my fellow crafters genuine love on their projects! 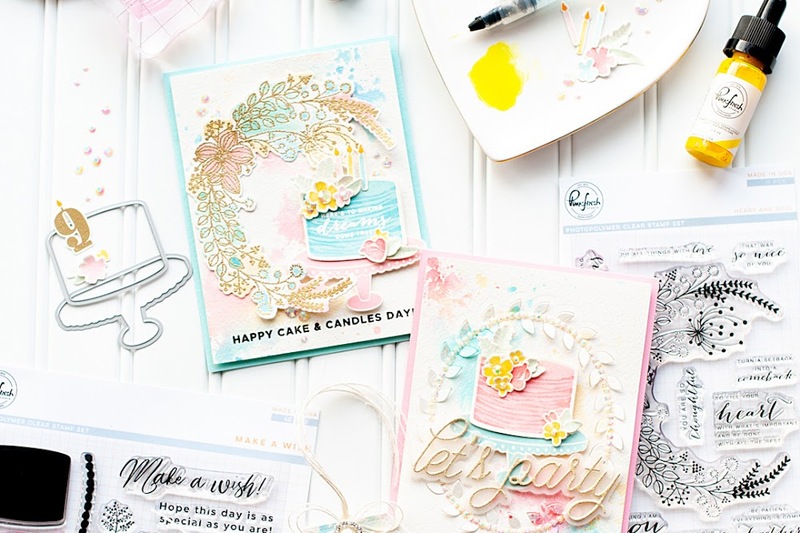 They have both already participated in this fun blog hop, but I decided that I wanted to stick with the two designers who immediately came to mind when preparing for my post today. Be sure to check out Jocelyn's post HERE, and Miriam's post HERE. I hope that you guys enjoyed getting to know me as a card maker a little bit more today. If you have any questions at all about me, my creative process, or any cards that I've made...feel free to ask! I will reply back in the comments....so be sure to check back. Hey there, blog friends! 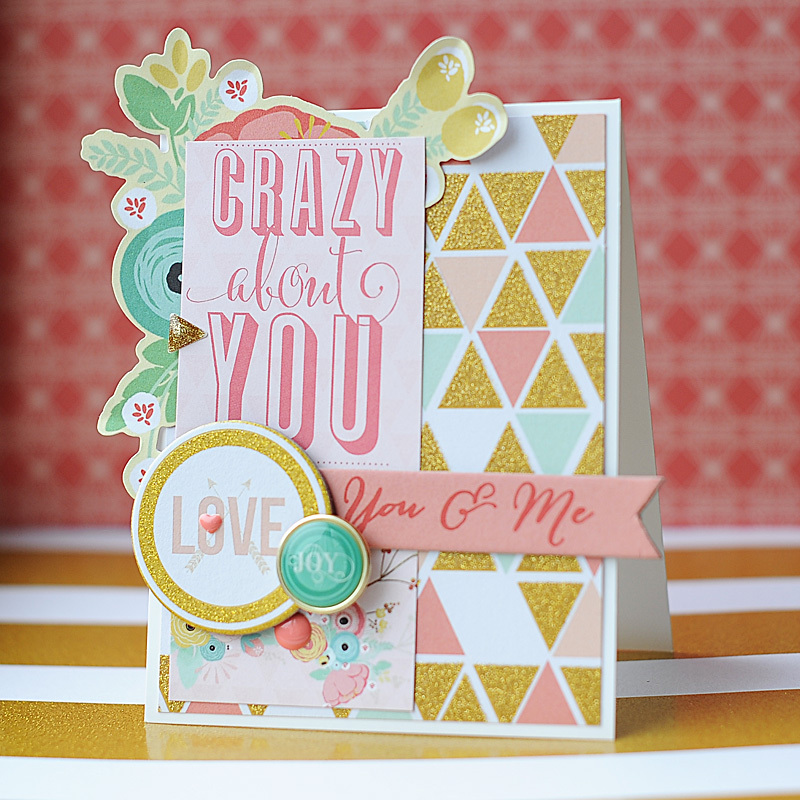 Today I have some projects using the new My Mind's Eye Jubilee "Sherbet" collection. 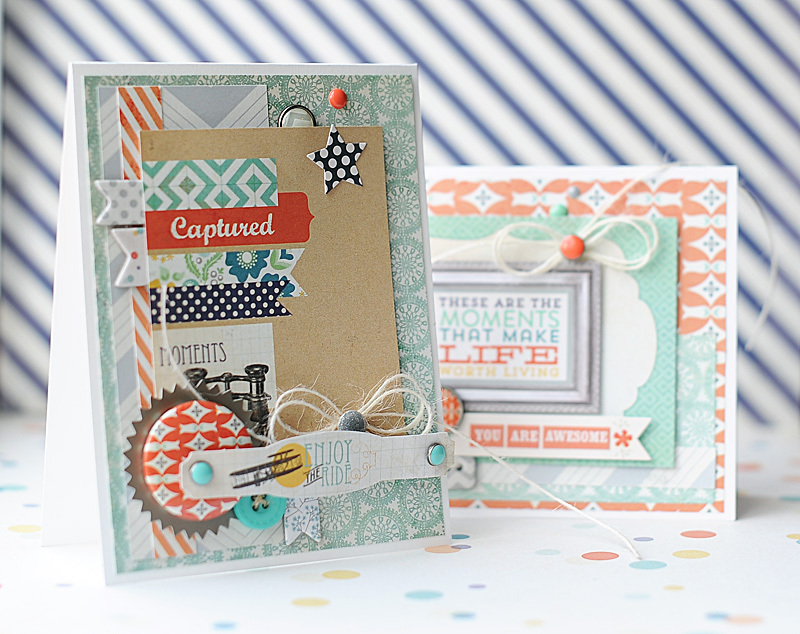 (These projects posted to the MME blog yesterday!) There is a special little lady in my life who is turning 1 this month, and this paper collection actually matched the cute outfit that I got for her perfectly!! 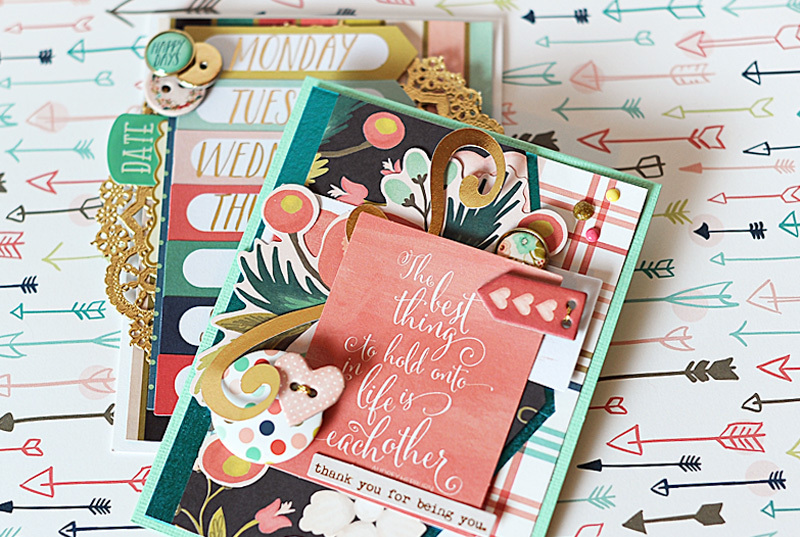 Supplies: Jubilee “Sherbet” collection: 12x12 paper (Happy, Pretty, Enjoy), 6x6 paper pad, chipboard elements, rub-ons, decorative brads, enamel dots, mixed bag, & journal cards. Now & Then “Milo” and “Dorothy” collections: alpha/word stickers. Necessities“Teals” and “Black & Greys” collections: washi tape. 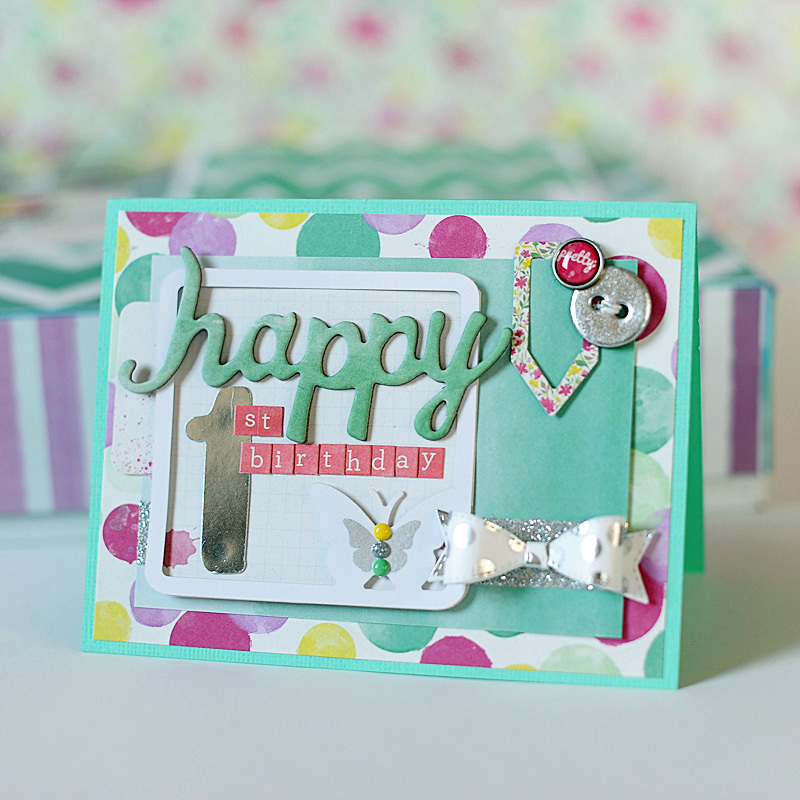 Other: Lil' Inker Designs bow dies & envelope liner die. I chose a gift box that was square in shape, and it was just a little larger than 12x12. I lined the edges with teal washi tape before adhering a dotted 12x12 paper to the top of it. I then added a chevron paper block to the bottom, and layered a strip of glitter washi tape over the seam. After that I diecut a Lil' Inker Design large bow from patterned paper, assembled it & added it to the top of the gift box. 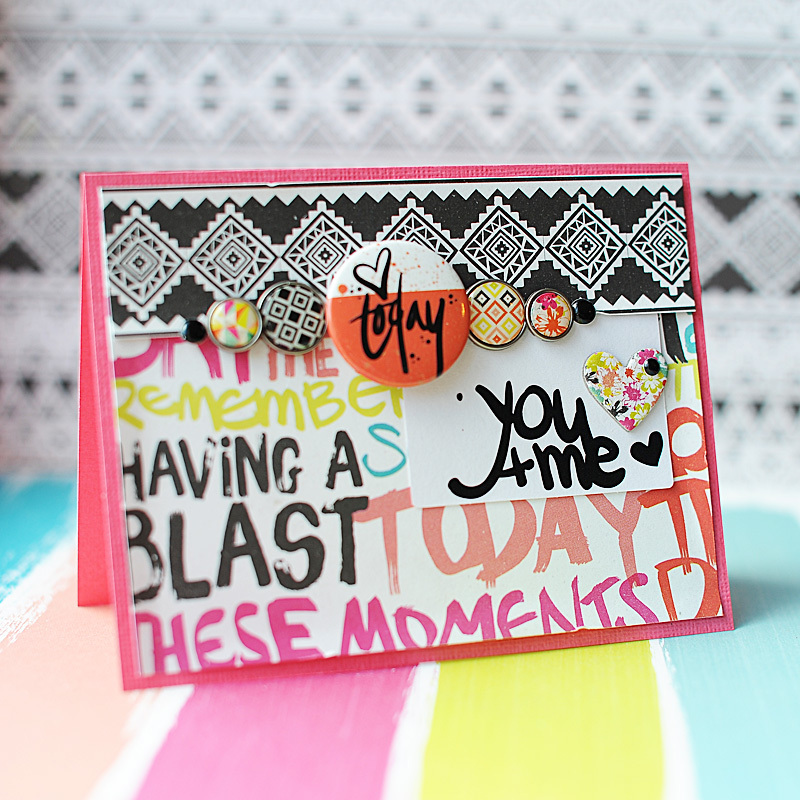 I then made a matching tag using a journal card, chipboard shapes & alpha/word stickers. I punched a hole in the top & strung twine through it, then topped it with a decorative brad. After finishing the tag, I added it to the top of the gift box. Then I made a matching card to finish the gift set. I layered some paper blocks from the Jubilee "Sherbert" 6x6 paper pad to the front, then accented with a diecut journal card & some embellishments. I also added a strip of glitter washi tape, and a washi tape bow. 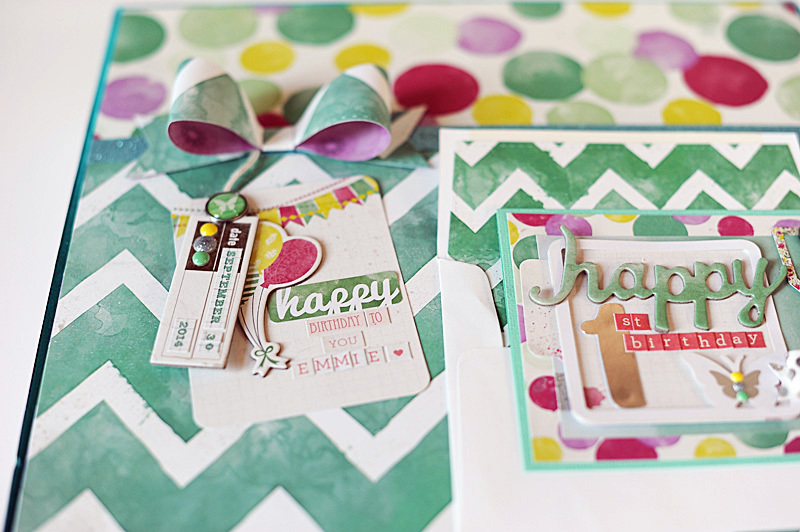 The envelope (shown in the first image) was also created to match the packaging by using the Lil' Inker Designs envelope liner die! 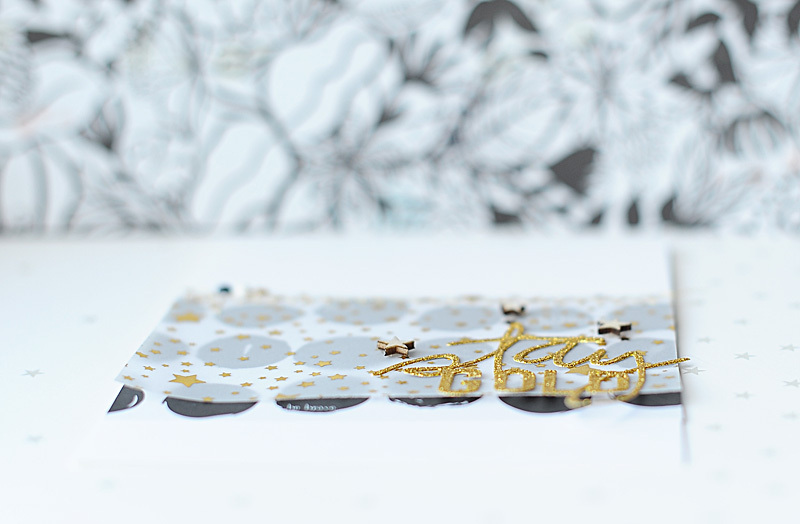 In order to make the washi tape bow, I covered a strip of white cardstock with the silver dotted washi tape. This way it would be rigid enough to run through my diecut machine. 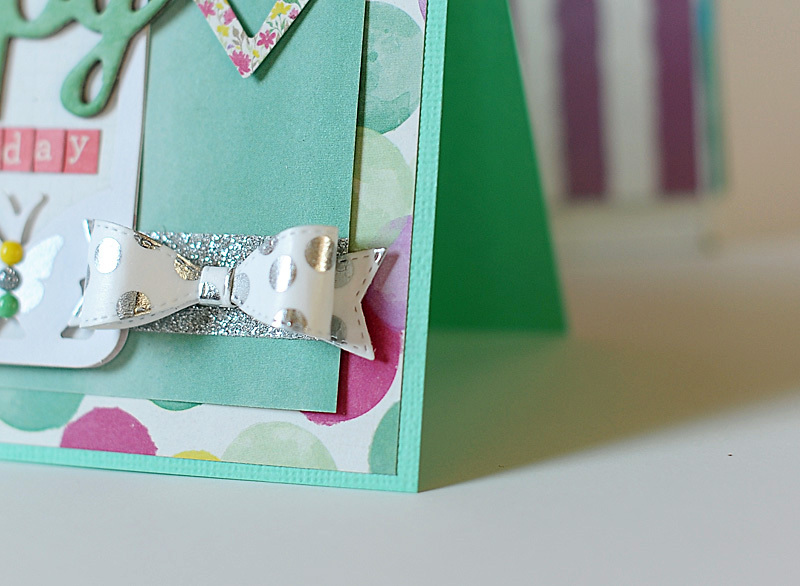 After diecutting the pieces using my Lil' Inker Designs small bow die, I assembled it & gave the bow some shape before adhering it to the card front. 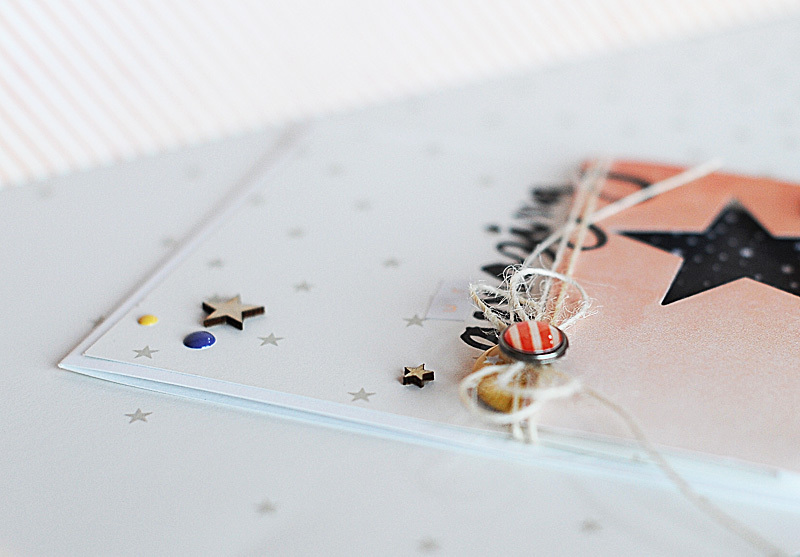 I think it is so fun to use my scrapbooking product to create fun gift wrap, & this one is extra special. You only have your first birthday once, so why not go all out? Thanks for checking out my projects today...I hope you've enjoyed them!! Well friends...I hope that you have a super wonderful weekend!! Hey there, blog friends!! How are you doing today? We went from 85 degrees on Monday to 52 degrees today....so THAT has been a shock to my system. Lol! I am SO not ready for cold weather, so I hope it warms up again a bit after this cold front moves through. Yikes! I mentioned on my last post that I have some news about my crafty life, but I am not quite ready to share it yet. Hopefully I will have a moment to think about how I want to write up the post & get it done for this weekend. 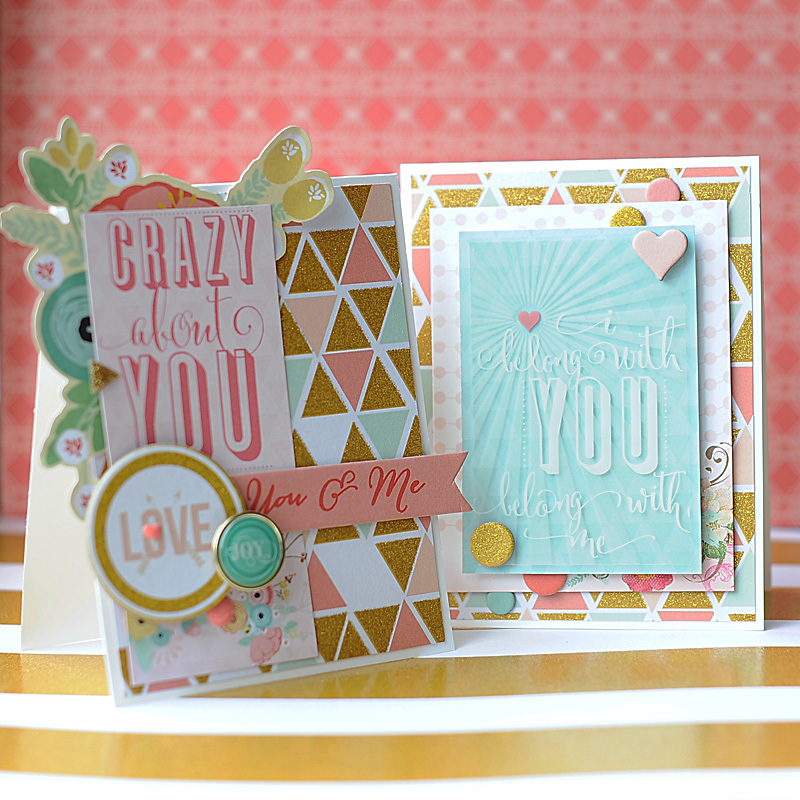 But today I have some cards using the new My Mind's Eye Jubilee Wild Berry products, and they are AWESOME! 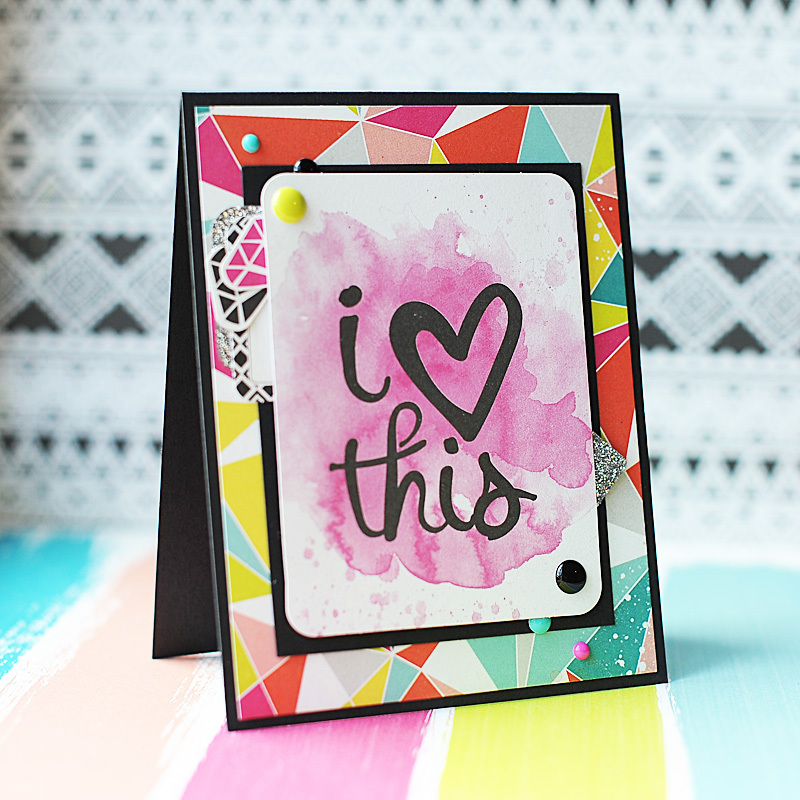 I will admit...I am completely smitten with the bold colors, brush script & tribal patterns included in this collection. Everything about it makes me smile, and I couldn't wait to pull all of the different elements out and start layering & piecing them together. 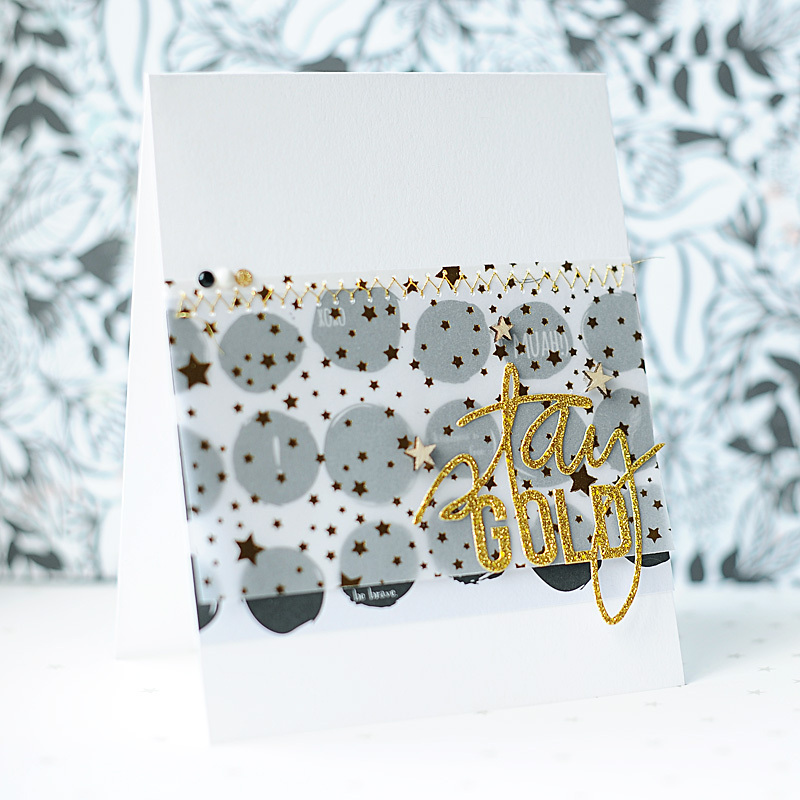 And because everything about this collection is so bold, I kept my card designs simple in order to not overwhelm your senses! Check them out! 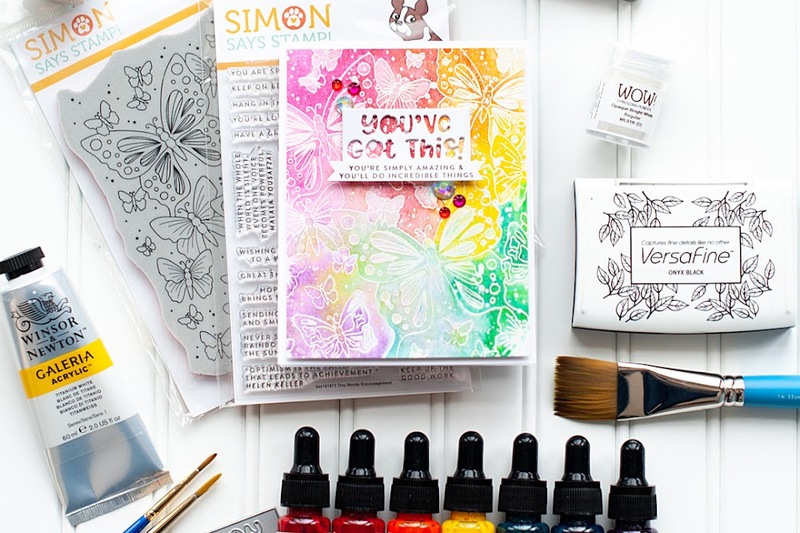 Supplies: Jubilee-Wild Berry: 6x6 paper pad, chipboard elements, rub-ons, flair pins, mixed bag, decorative brads, enamel dots, & journal cards. 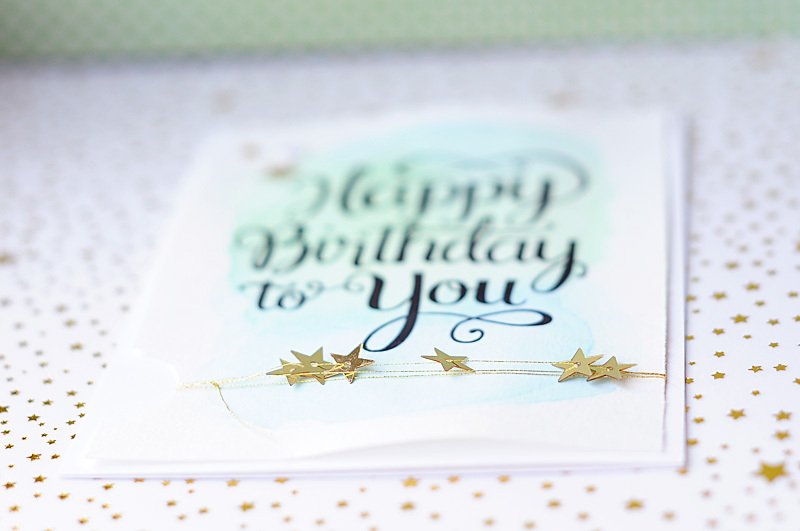 I love the bits of dimension that all of the fabulous My Mind's Eye accents & embellishments add to my cards, especially from the brads & enamel dots. They are some of my favorite accents!! Thanks for checking out my cards for today....I hope you enjoyed them!! Hi there, blog friends! How has life been? I know that I have been fairly absent from my blog this summer. Even in the posts that have gone up, I feel as though I have been distant. In all honesty, I have felt a bit off creatively since coming home from Montana in July. I've been pretty quiet on all of my social media fronts (blogging, Facebook & Instagram)...plus I've just been super busy and we've been gone a lot. I have stepped down from a couple of creative teams (I'll talk more about that this weekend when I have a longer sharing post) in hopes to rejuvenate a bit, and feel it will really help me to create for something other than design team deadlines. The start of Fall always helps bring back the creativity that I feel I lose most summers. And while I am not ready for colder weather (ugh), I am ready for a little more time to sit down at my crafty area with a hot latte or chai. With that being said, one team that I am staying on until they kick me off (lol) is My Mind's Eye!! My projects have been running on the MME blog all summer long, but I haven't had as much time to get them posted here. So, I wanted to catch up on some of my projects from the past couple months! 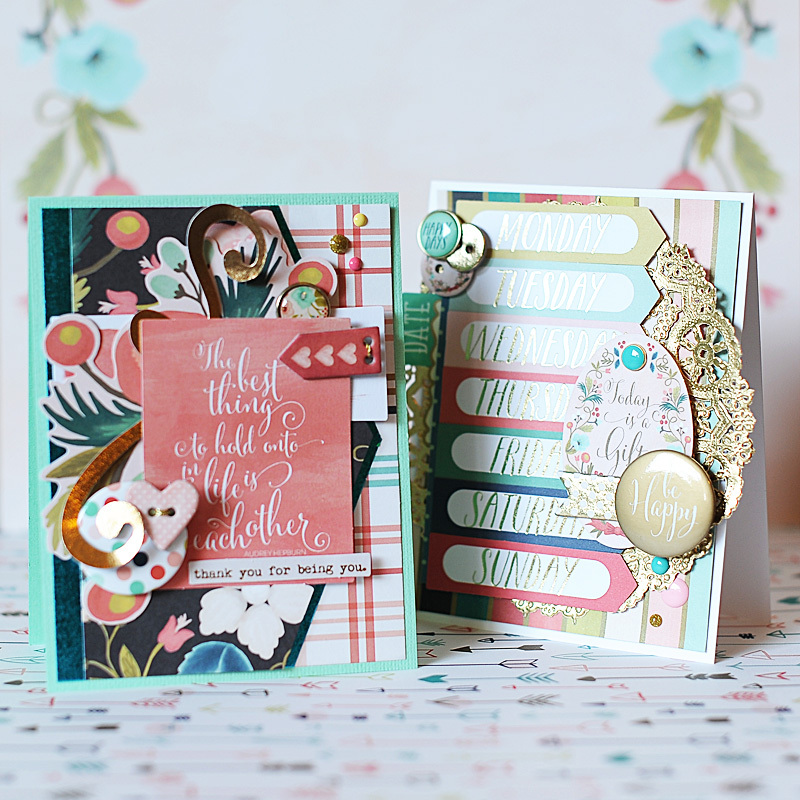 Up first is this card set using some of the new Just Sayin' collection by Rhonna Farrer. Rhonna never disappoints....like ever. I have loved her product from the early days at Two Peas & Autumn Leaves (do you remember THAT company?! Lol!) to her more recent collections for MME & her digital community. This next card set I revisted some products that were released earlier this year. 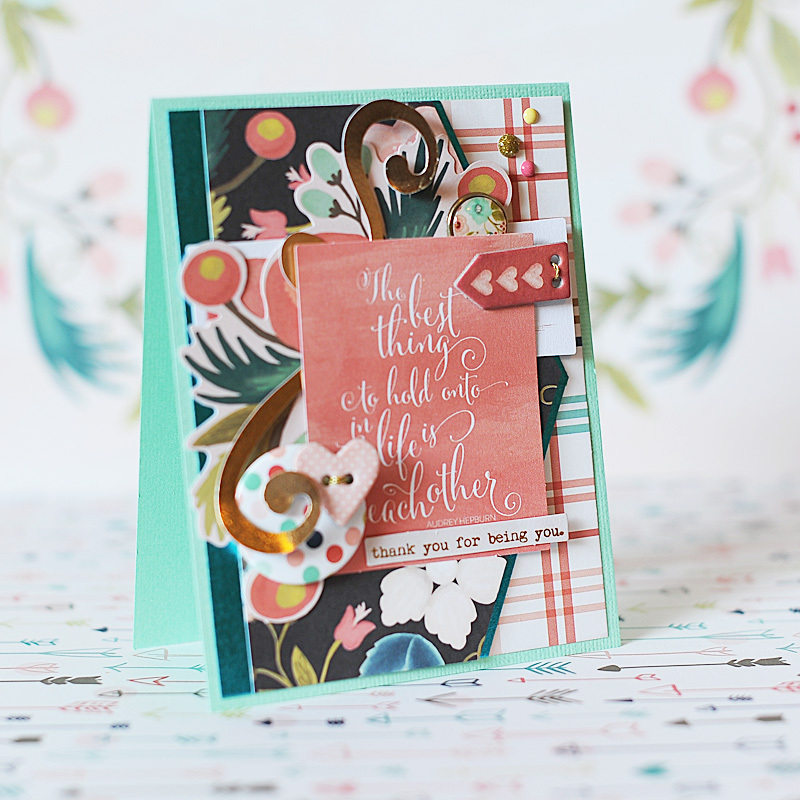 I used the Now & Then "Izzy"collection by Jen Allyson. I LOVE how these cards turned out! I don't often make very masculine cards, and I think they would work perfectly to give to the special men/boys in your life. I have one last set of cards to share with you using the Market Street "Ashbury Heights" collection. Seriously....what isn't there to LOVE about the Market Street collections. 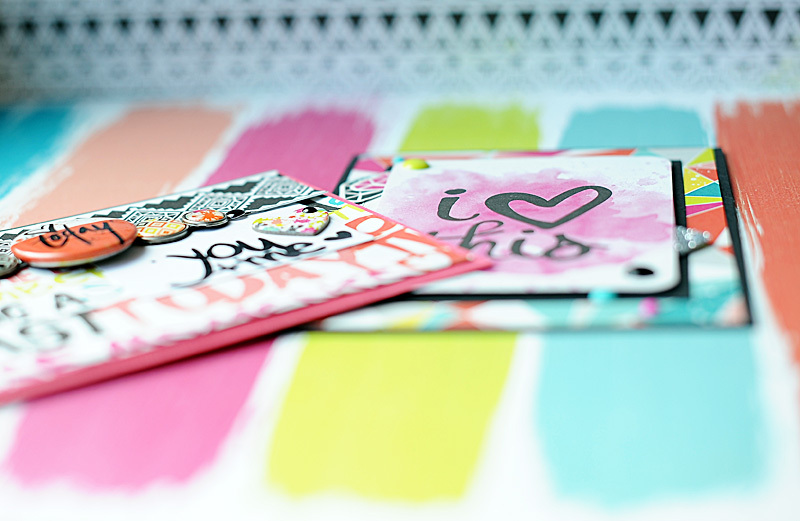 BOTH of them are amazing, and I used lots of products on these two cards & just layered, layered, layered. Well, there you have it!! A quick catch up on the projects I have made recently for the MME blog!! I have another card set posting to on Wednesday, and I will make sure that they post here as well. I hope that you have a wonderful evening, and I will be back soon to share a little bit more about where I am at creatively, and hopefully have more projects!! Congratulations Rita!! Please email info @ winniewalter.com (without the spaces) with your name, mailing address and your choice of stamp set from the August Release. 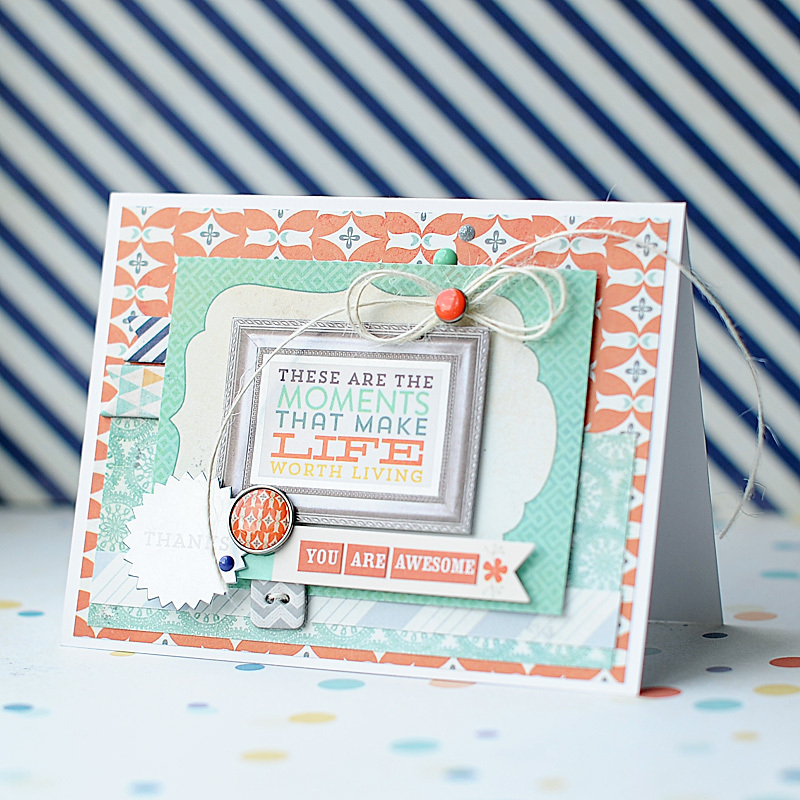 Thanks for playing along with our blog hop & checking out our newest stamp designs!! We can't wait to see what you do with them!